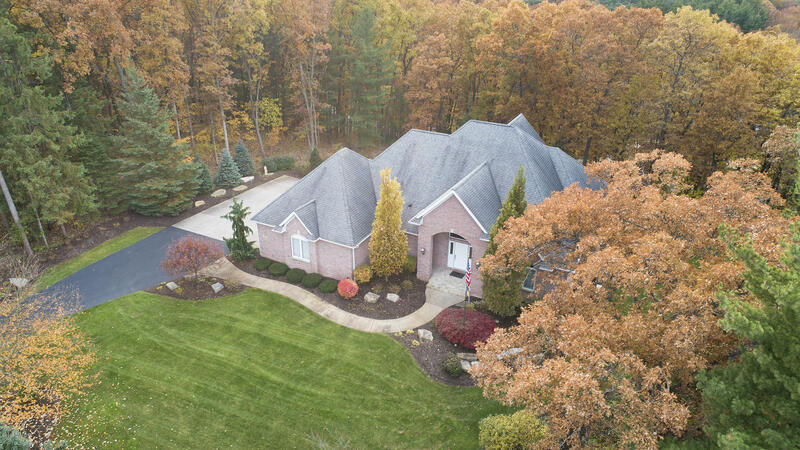 This custom built brick executive walkout ranch is perfectly situated on a premier elevated lot in the highly sought-after Catamount neighborhood. The covered front porch with beautiful stonework leads to the tiled entry. French doors open to a dining room with tray ceiling on one side and a tiled full bath on the other. The spacious living room has vaulted ceilings, marble fireplace, tinted windows, and surround sound. The huge tiled Chef's kitchen with granite counters and center island, double oven, built-in desk, and buffet with wine rack is open to the eating area and both have access to the large deck overlooking the professionally landscaped yard. The main floor master suite has tray ceilings and a private full bath with a walk-in closet, dual sinks, and a jacuzzi soaking tub. A main floor laundry with quartz counters completes this level. The walkout level has a family room with access to the patio, 3 additional bedrooms, a full tiled bath with quartz counters A main floor laundry with quartz counters completes this level. The walkout level has a family room with access to the patio, 3 additional bedrooms, a full tiled bath with quartz counters, and ample storage. A three stall attached garage with hot water, hard wired 16 kilowatt home back-up generator, 4 zone furnace, underground sprinkling, a tranquil outdoor water feature, and great attention to detail are just some of the extras to be found in this prime location on a cul-de-sac away from through traffic and in a gated community.